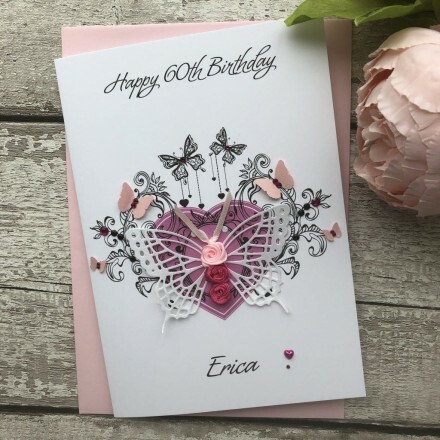 This card features a background image of an ornate pink heart that is decorated with a stunning rosebud shimmering butterfly. This design is finished with jeweled butterflies and sparkling gems. This personalised handmade birthday card is teamed with a matching square envelope, protected in a sealed cellophane bag and sent to you in a double board outer envelope to ensure it arrives in pristine condition.